Iran on Tuesday test-fired the Kavoshgar 3 satellite carrier, sending its third explorer - with living organisms onboard - into space. The Kavoshgar 3 (Explorer) rocket, carrying an experimental capsule, transfers telemetric data, live pictures and flight and environmental analysis data. The Iranian Aerospace Organization (IAO) says live video transmission and the mini-environmental lab will enable further studies on the biological capsule - carrying a rat, two turtles and worms - as it leaves earth's atmosphere and enters space. In February 2008, Iran became the 11th country to have acquired space-related technology by blasting Kavoshgar 1 into space. The second Kavoshgar, which carried a space-lab and a restoration system, was launched in November 2008. The Kavoshgar 3 rocket is an updated version of the previous models. Live transmission from the Kavoshgar 3 rocket as it leaves earth's atmosphere. 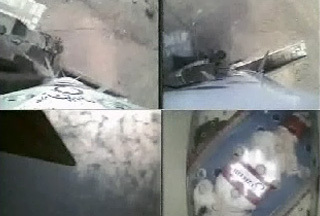 The biological capsule (bottom left) carried a rat, two turtles and worms into space. Defense Minister Brigadier General Ahmad Vahidi on Wednesday hailed the successful launch and insisted on the "peaceful" nature of Iran's space program. "Iran will not tolerate any un-peaceful use [of space] by any country," General Vahid was quoted as saying by the Islamic Republic News Agency (IRNA).